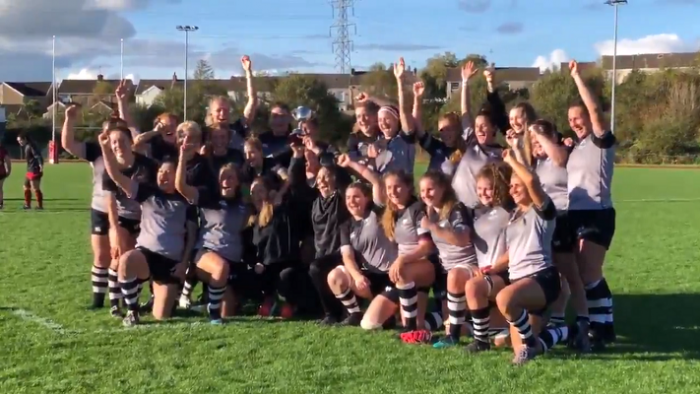 Ospreys were crowned Welsh regional champions after a six try victory against RGC. A converted consolation try from RGC in the second half put the visitors on the board, but wasn’t enough to deny the Ospreys the title. With a 110-match point advantage at the start of the game, Ospreys would have had to lose by an unheard of margin to fail to retain their title in their sights in a double-header at Parc Y Scarlets, but they were out of the blocks early, after an early break from the pack saw them take play into RGC’s half. Solid carries from the forwards set Robyn Lock up nicely to ground the opening try of the game with just six minutes on the clock. Keira Bevan slotting the conversion put the side 7-0 ahead. A few minutes later a nicely timed chip cross field found the hands of Sasha Bailey to run in the second try of the game. No conversion, but the Ospreys were 12-0 ahead. A run from the halfway line from Emma Hennessy drew in Ffion Bowen to send the centre clear over the whitewash for try number three. Bevan adding the extras to extend the Ospreys lead 19-0. Firmly in control of the game, Ospreys won them the penalty to kick for the corner. A driving maul and strong run made room for skipper Siwan Lillicrap to ground the bonus point try to hand the Ospreys a 24-0 lead with no conversion. As halftime approached a quick turnover left RGC struggling to gather their defences, and Lock was quick to take advantage. Bursting through for the break sent Lock clear to score try number five for the side, with Bevan kicking the conversion to give the Ospreys a healthy 31-0 lead at half time. A slow start to the second half, left both sides struggling to gain the upper hand and take advantage. It wasn’t until 20 minutes into the half that the first of the points were scored. An overlap out wide saw RGC clear to run in the try, with the conversion putting the North Walians on the board 31-7. In the day's other match, the Scarlets beat Dragons for their second win of the tournament, to finish third overall, with Dragons ended last, Cardiff Blues were series runners up, RGC ended fourth.